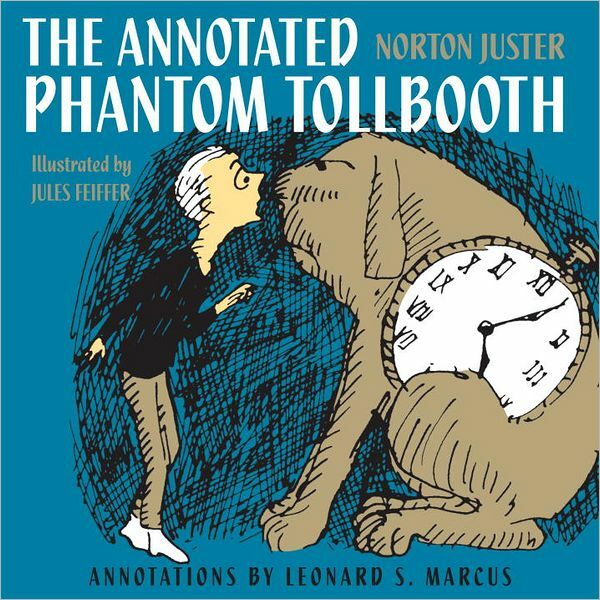 The brand-new Annotated Phantom Tollbooth is aimed directly at parents like me. 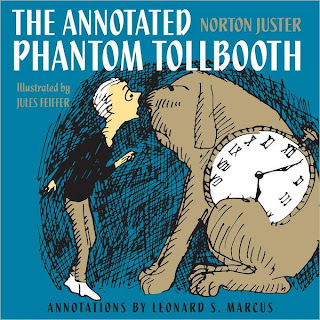 It's exactly what it says it is: An extra-wide edition of the book, so designed to leave room for "annotations" in the margins (by historian and critic Leonard S. Marcus) about the ideas and inspirations behind Juster's characters and situations, as well as illustrator Jules Feiffer's eternally memorable rendering of them. Now, I don't think this is necessarily the best edition of the classic to use to introduce the book to one's own kids, full of distractions—and fairly serious-minded distractions at that—as it is. But it's almost a must-have for any adult (or teen, or maybe even tween) for whom this book holds a special place. And since it seems to have had that effect on many of us, chances aren't bad that our own kids will, in due time, come to enjoy leafing through the pages of this edition to find out where these two visionaries got their brilliant ideas. I've written a few times before about the wonderful Scholastic Storybook Treasures series of DVDs, which created animated shorts out of kid-lit classics past and present. 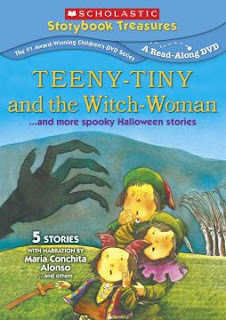 For Halloween, they've got a new one out: Teeny Tiny and the Witch Woman . . . and More Spooky Halloween Stories, aimed at kids ages 4 to 9. 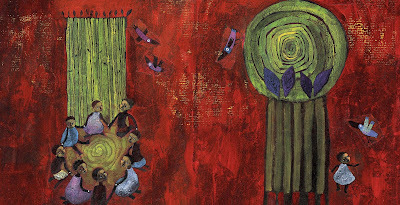 It packages together five shorts, including the old-school-scary title story (this video was originally made way back in 1980) by Barbara K. Walker, and narrated with panache by Marie Rosulková. We're big fans of just about every video in this series, but since (as I think I've mentioned before) our older son is a mini Tim Burton, obsessed with all things spooky and creepy, this DVD happens to be one of his all-time favorites. If you have a little one with similar leanings, or just need a good Halloween-themed video for the kids this year, you can't go wrong with this one. Update: New Kideo, the company that puts out these Scholastic DVDs, is having a giveaway of this very one (plus another one) on Facebook currently! As I've mentioned before, it's always especially thrilling to get a great new children's CD from an artist I don't already know. Don't get me wrong: Our family eagerly looks forward to every new release from our favorite established artists, of course. But there's something special about happening on a gem without those prior expectations. 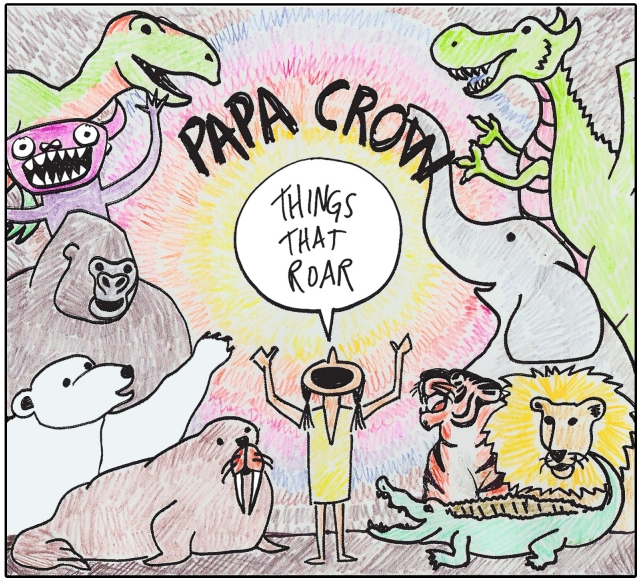 So I'm happy to report that the debut CD from Papa Crow (the recording moniker of Michigan-based singer-songwriter Jeff Krebs) belongs right up there with the latest Dan Zanes release. 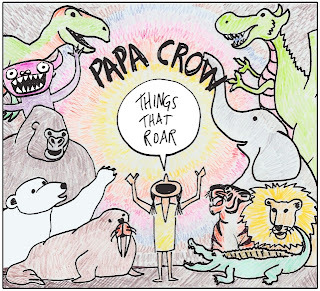 Things That Roar is quality indie folk-rock for kids, largely acoustic guitar (with some mandolin, ukelele, and steel guitar thrown in) in the vein of Zanes as well as James Taylor, Nick Drake, and the softer sides of Neil Young and R.E.M. (There's even a nod to Leonard Cohen, appropriately enough in the childhood fear–themed "I'm Not Afraid Anymore.") The 14 well-crafted songs cover basic kid themes (animals, balloons, growing families) in remarkably unsappy, satisfying ways; Krebs has the knack of letting a simple theme express itself without excess embellishment. Things That Roar feels like the ideal album to listen to with a toddler or infant—though my six-year-old loves it, too!—on a sleepy, snowy winter afternoon. It's nothing fancy, just (quietly) one of the year's best kids' CDs. I'm really glad I've had the chance to hear it. 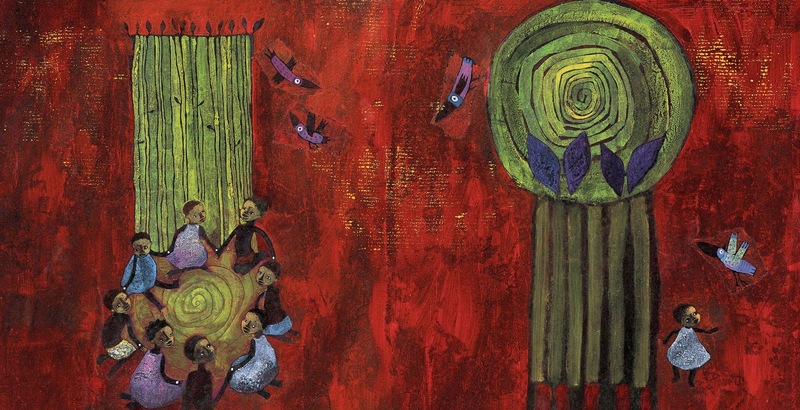 World music—a term no one really likes but no one has come up with a fully utilitarian replacement for, either—has always been a big part of children's music, going at least as far back as Pete Seeger's interpretations of folk songs from foreign lands. Today it's pretty much its own subgenre; Putumayo alone puts out several excellent world music (or world-music inspired) albums a year. 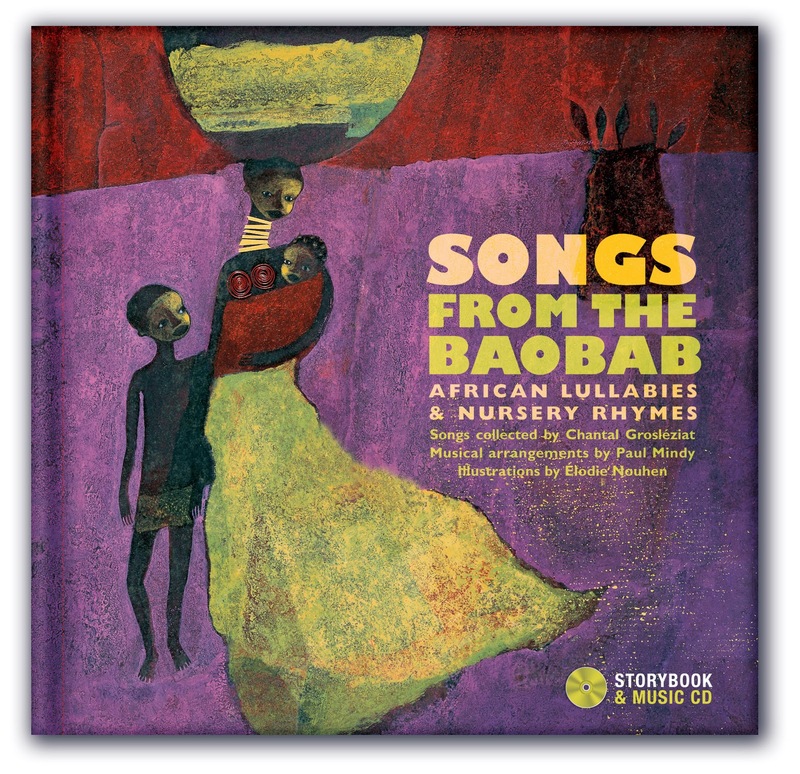 But I've never heard anything quite like the lovely Songs from the Baobab, a new book-CD combo from The Secret Mountain. 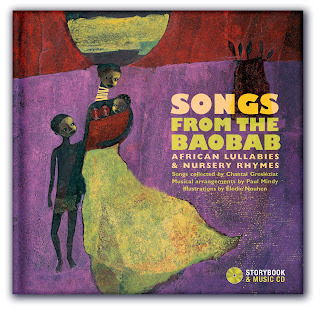 It features 29 tracks of lullabyes and nursery rhymes in 11 different languages from Central and West Africa, sung by adults and children and played on indigenous instruments. The lullabyes, some essentially chants, are hypnotically soothing, perfect for lulling newborns and infants to sleep (as some have presumably done for generations). The more upbeat tracks, meanwhile, tend to be irresistible attention-grabbers, whose lyrics (translated for us in the accompanying book, which also features gorgeous illustrations by Elodie Nouhen, themed to the songs) are funny and moving and often profound. Many parents will want to know more about these songs, and that informations is provided in the book—nation and language of origin, and in many cases interesting facts about the genesis of the songs themselves. Kids, meanwhile—and this is one of those albums that will appeal to a particularly broad age range of them, literally from newborns on up—will just love listening to them. I wrote my very first post on this blog about the first two volumes in George O'Connor's Olympians series of graphic novels about the ancient Greek gods, so I'm a little ashmaed that it took me this long to get around to the third installment. (I mean, the fourth is just around the corner.) I spent much of that previous post marveling over O'Connor's ability to create compelling, action-packed, illustration-driven narratives while remaining remarkably true to both the letter and the tone of the ancient mythology. And if anything, he trumps himself in Hera: The Goddess and Her Glory. As the author points out himself in the book's end notes, the queen of Olympus is a tricky subject, portrayed in most of the best-known myths as a shrewish wife and a vindictive punisher of both the various mortal women who are seduced by her husband, Zeus, and their progeny by him. 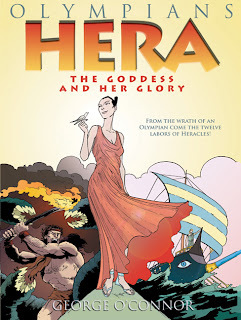 Yet O'Connor has found a way to add a feminist slant to Hera's story—one that doesn't feel the least bit forced—by smartly mining some of the lesser-known variants on these stories, particularly the ones surrounding Herakles. (His very name—which translates as "the glory of Hera"—gives an author a lot to work with, and as his subtitle indicates, O'Connor doesn't disappoint.). This may be the former classics major in me speaking here, but I'm blown away by the extent of the author's research, and even more by what he's able to do with it. Mind you, Hera is also every bit the engrossing page-turner that O'Connor's previous two Olympians books were; our six-year-old was difficult to separate from Zeus: King of the Gods and Athena: Grey-Eyed Goddess for the better part of a year, and this situation looks no different. (If anyone doubts my word, here's some direct-source backup for Hera's immense kid appeal.) All the Olympians books are in classic comic-book style (by which I mean the comic-book style of my childhood, naturally! ), and it once again suits these tales perfectly. While I believe I have seen the labors-of-Herakles/Hercules stories executed in a comic-book format before somewhere or other before, the difference here is that O'Connor's is a really good graphic novel, one you—I mean, a kid—can read happily alongside the top entries in the genre. There's a reason these myths have had such staying power through the millennia—and O'Connor has captured it in these pages. P.S. : I just discovered that O'Connor also has a truly awesome Olympians website as well, with background on the mythology and the cast of characters, activities for kids, even resources for teachers! It will clearly be a challenge to keep Dash off the computer this month. 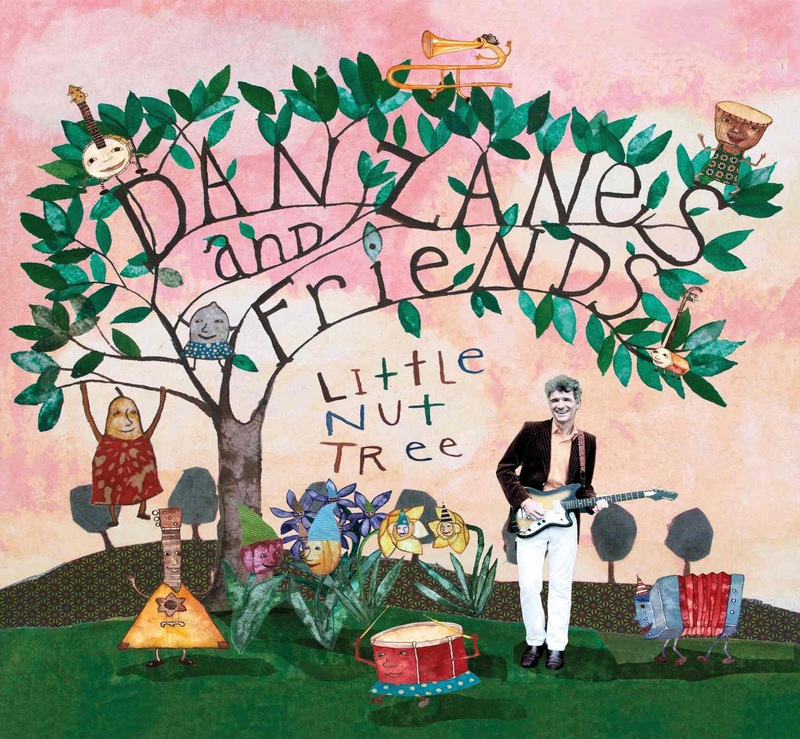 Back in the anxious days before the arrival of my first son, I remember a work colleague who was already a parent asking me if I had any Dan Zanes albums yet. I didn't know the name, and she looked at me a little incredulously across the divide that is parenting before smiling and saying, "You're probably going to playing him a lot. And you'll be happy about that." She was right. Maybe I'm partially biased for having lived in his home turf of Brooklyn for two of those early parenting years, but I think of Zanes as the quintessential modern children's musician, the archetype who encapsulates everything that sets the genre apart today from years past. Indie cred from a band popular with the generation that's now knee-deep in parenting? Check. (Zanes was the frontman for the Del Fuegos.) Eclectic guitar-based musical style featuring a dizzying array of guest stars, some of the celebrity variety (Deborah Harry, Natalie Merchant), others simply great musicians? Check. Known for putting on irresistibly charming and audience-friendly stage shows, no matter how large his popularity and the associated venue size grows? Check. Zanes was one of the first musicians to nail the sweet spot of music for kids that their parents also actually enjoyed listening to. By this time, it's easy to take him almost for granted among the panoply of artists creating kid tunes with adult-music sounds, from rock to punk to hip-hop. 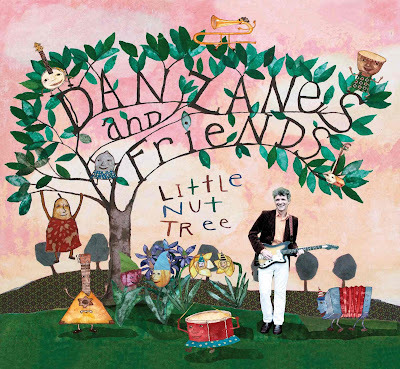 But all along, Zanes and his band of "Friends," as he labels his band and guest artists each time out, have been putting out CD after CD of great music, expertly mixing traditional songs from the U.S. and around the globe with inspired original compositions. On his latest, Little Nut Tree, Zanes and company maintain his high standard, with seeming (though surely not actual) effortlessness. In his accustomed laid-back, breezy style, he and his guests—this time including the likes of Sharon Jones and Andrew Bird as well as old Friends Rankin Don/Father Goose and the wonderful Barbara Brousal—offer up sweet songs from Jamaica, Haiti, Tunisia, and the American Populist movement of the 1890s, as well as a number of Zanes's own original compositions. As always, the arrangements and the playing are top-notch, the mood is upbeat and celebratory, and the overall effect is one big smile. Shortly after we moved to the suburbs, we had the insane luck of acquiring a baby grand piano for just the cost of moving it about five blocks. (I remain in your eternal debt, Craigslist.) I don't play myself, but my wife does, and she remembers learning as one of her warmest childhood memories. To this day, even a few uninterrupted minutes at the piano is one of her favorite ways to relax and unwind. This, as I know from friends' anecdotes about martinet teachers, is not everyone's experience of learning to play an instrument. So while we both would love our sons to make use of this gift from the suburban gods, we haven't pushed the issue; we decided to let the piano come to them, as it were. 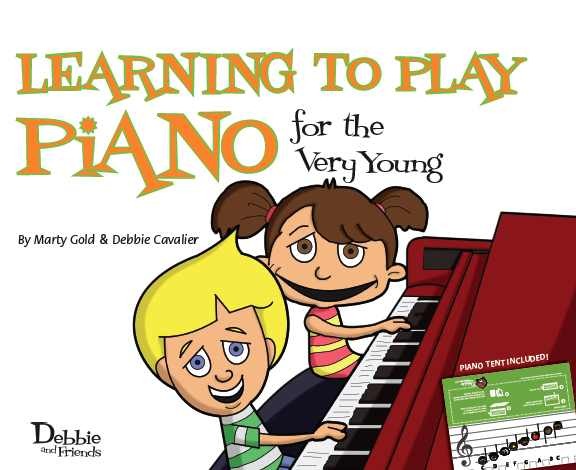 Both are showing interest in music in general, and the piano in particular, but the three-year-old doesn't have the attention span for any actual instruction yet, in our opinion. And to be honest, neither does the six-year-old, Dash, for whom the required focus remains something of a weak point. 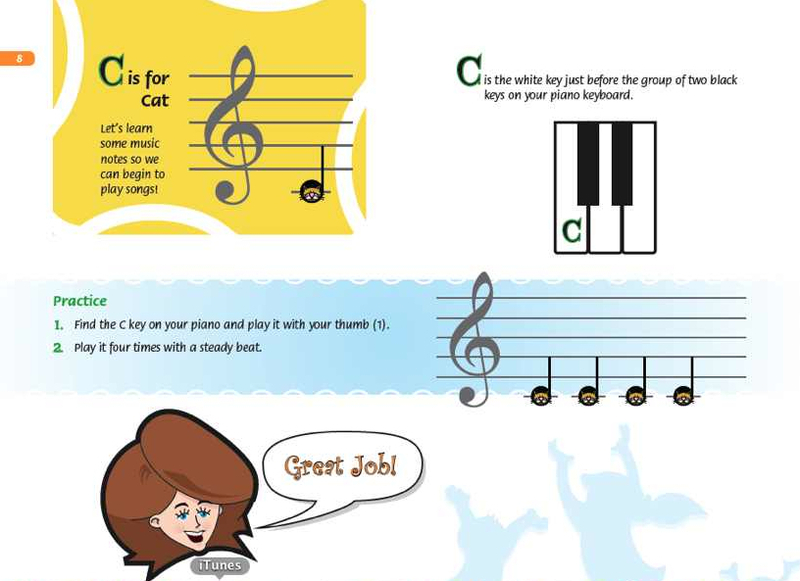 It's a 24-page primer aimed at preschoolers, but it works well even for an early grade-schooler without any training like Dash at getting the basic concepts across—the association of notes with letters, say. It's helpfully interactive--asking kids to write in finger numbers and note names—and just organized enough to help a child in a playful, not overly task-driven, manner. It slowly works up to getting kids to play simple, familiar songs ("Twinkle, Twinkle" and the like) with their right hand. At least for a book-obsessed kid like Dash, just seeing these basic concepts on paper was immensely helpful. At a time in his life when he wasn't ready for more formal methods of instruction, he dove into Cavalier and Gold's book and seemed to grasp its lessons—some of which my wife had been trying to get across for months—almost instantly. Now, the jury is still out—still being selected, really—on whether Dash will take to the piano, or get beyond the initial stages at all. 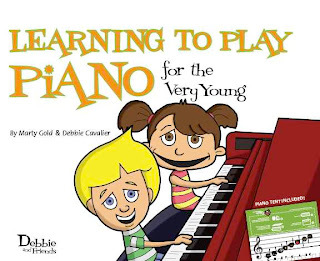 But in terms of teaching him the building blocks of piano in a low-key, undemanding way, and thus setting him up to take the next steps if he so desires down the road, Learning to Play Piano for the Very Young is just what we didn't even know we were looking for.